During the 20th century, much of the historic 19th-century building fabric of West Melbourne was destroyed. A case in point is the West Melbourne Baptist Church. In 1866 a bluestone church to serve the Baptists of West Melbourne and Hotham was erected on a triangular block immediately south-west of the Victoria Street/Errol Street corner and opposite the south-eastern boundary of the Benevolent Asylum, the area's first building, which straddled North and West Melbourne. During the next 30 years or so, the church was extended considerably and various ancillary buildings, including a lecture hall, Sunday school and kitchen, were erected at the back of the church. In 1917 the existing brick manse was built and on 10 September 1921 the tennis court was opened. It was situated at the corner of King and Hawke streets, facing onto Hawke Street. 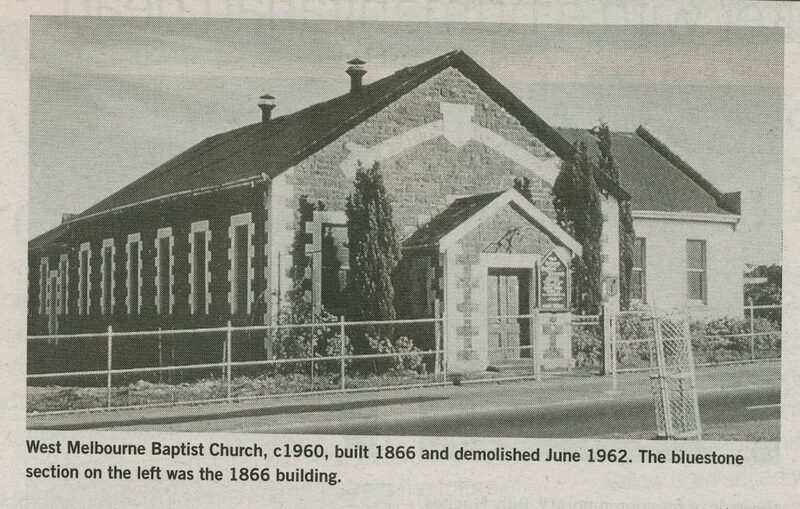 In 1961 the church received notice from the Melbourne and Metropolitan Board of Works (MMBW) that the board intended to resume the property for roadworks. The expected early resumption of the property made uneconomic the repair of the church, which was in poor condition and with major structural weaknesses. It was therefore demolished in June 1962 and the site leased for use as a service station until such time as the MMBW would take it over. Had the building survived it would have been 140 years old this year. However, in 1986 the MMBW gave notice that it was no longer interested in the property, and the resumption order was removed, thus freeing the site for long-term development. After considering a range of possibilities, including selling the site or leasing it to a developer, the church decided that the service station area should be leased for a fixed period, thus providing funds for the immediate development of the manse area and for the ongoing work of the church. The present chapel, at the rear of the manse and facing onto Curzon Street, was completed just in time for the Christmas service in 1990. Many other institutions and residences in West Melbourne suffered a similar fate. During 2006, the Hotham History Project will be collating existing research on West Melbourne, identifying gaps requiring additional research and drawing together the recollections and oral histories of local residents with a View to publishing a people’s history of the area. If you are interested in being involved in this project, please contact Lorraine Siska (9328 1621, lsiska@bigpond.net.au) or Mary Kehoe (9329 5814, mekehoe@iprimus.com.au) to discuss ways in which you can become involved. by Mary Kehoe - member of the Hotham History Group, March 2006.